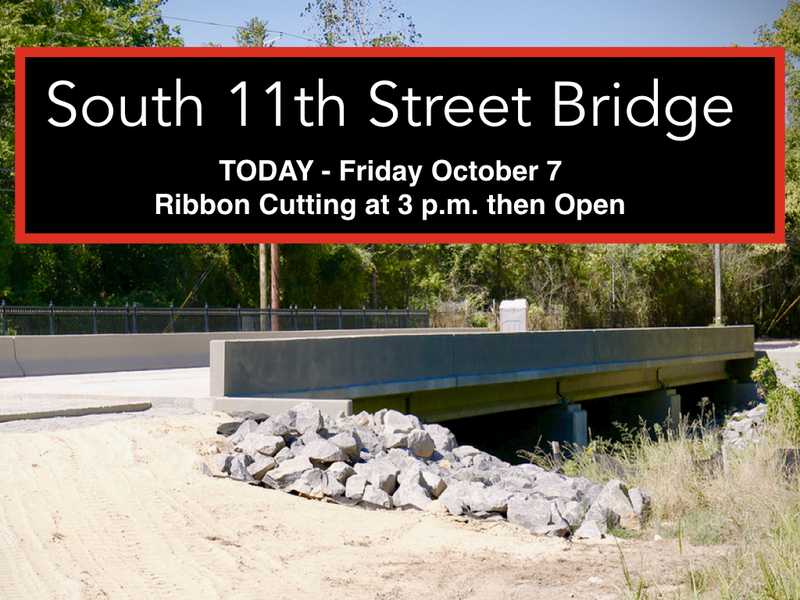 – The City of Gadsden is excited to announce that the South 11th Street Bridge will open today Friday October 7, 2016 at 3 p.m. We will hold a brief ribbon cutting ceremony and open the bridge to traffic. The bridge replacement project started on December 1, 2015 and was scheduled to take a full year. The project was completed with minimal delays due to careful and expedient work from the various contractors, JBWT, Inc. the consultant engineer that handled design and construction engineering/inspection services for the project, and strong supervision from the City of Gadsden Engineering Department. The new bridge is a modern, high capacity bridge with a separate pedestrian walkway that will increase safety for motorists and pedestrians. The previous bridge was built in the 1940s and wasn’t sized appropriately for current traffic needs. South 11th Street is the only thoroughfare that connects Downtown to South Gadsden. It also ties into Black Creek Parkway near Gadsden City High School and I-759. The bridge handles a substantial amount of traffic including dense traffic destined for GCHS and Coosa Christian Schools. Traffic detours though residential neighborhoods will immediately stop and traffic patterns will resume to previous normal routes.